The Queen size Simmons Beautyrest Silver Adda III Plush is an affordable mattress for couples that offers excellent comfort for the price. Scoring a 4 on our Comfort Scale, this mattress provides sufficient body contouring for back and stomach sleepers without sacrificing support. Side sleepers should search for a softer Beautyrest model that provides plenty of pressure relief and ensures proper spinal alignment. This model offers many improvements from the Adda II in the Recharge Collection. DualCool Technology Fiber makes up the initial layer. This is an incredibly soft fiber that is enhanced with silver to aid in moving heat away from the body. This fiber also prevents odor-causing bacteria, mold, and mildew to offer you a sleeping space that is clean and fresh. To help prevent tossing and turning, two layers of AirCool Foam are added that provide pressure relief. This foam also features a channeled surface design that increases airflow through the mattress. To offer you close contouring and promote deeper REM sleep, the mattress includes a layer of GelTouch Foam. 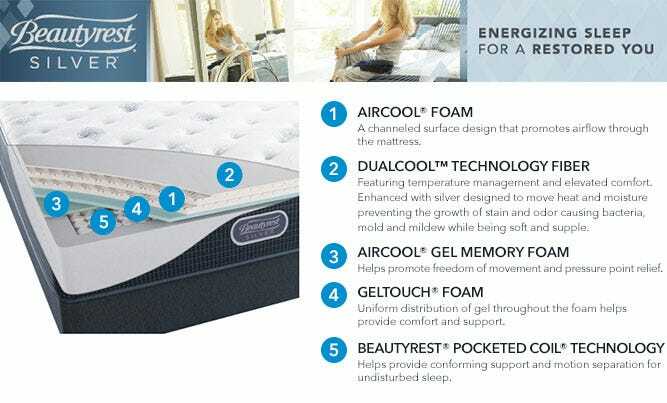 A layer of AirCool Gel Memory Foam is incorporated into the center third to reinforce support to the lower back and promote lasting durability. Expertly designed, the 815 Density Beautyrest Pocketed Coil System provides essential contouring to the lower back, and it is adjustable base friendly. This system also helps minimize motion transfer, which is particularly beneficial for couples sharing a Queen size. The mattress is surrounded by a thick, ventilated edge support system to ensure that comfort is consistent across the entire sleeping surface, and it also helps move air through the mattress. 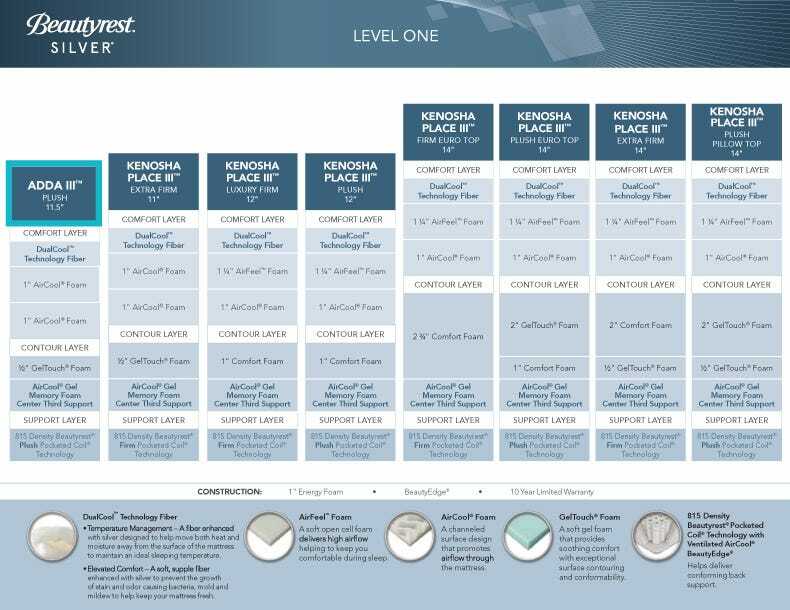 To summarize, the Queen size Simmons Beautyrest Silver Adda III Plush is a perfect mattress for couples looking for an option with a medium-firm feel. King 11.5" 76" 80" 81.2 lbs. Cal King 11.5" 72" 84" 83.5 lbs. Queen 11.5" 60" 80" 64 lbs. Full 11.5" 53" 75" 53.6 lbs. Full XL 11.5" 54" 80" 56.2 lbs. Twin 11.5" 38" 75" 39.2 lbs. Twin XL 11.5" 38" 80" 41.3 lbs. 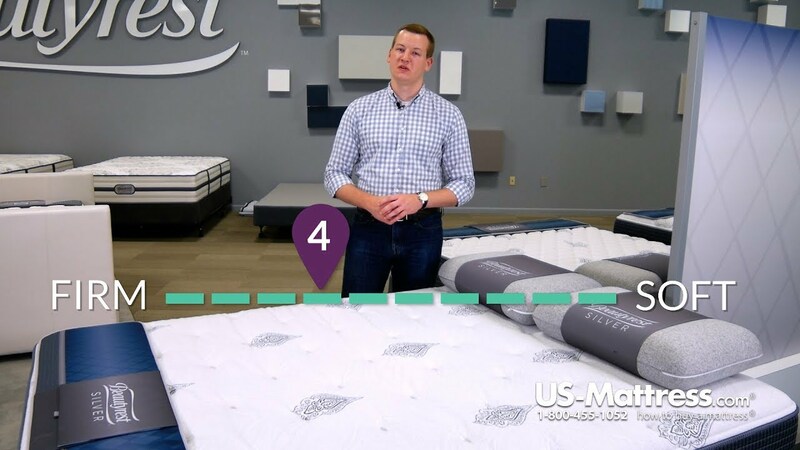 Mattresses change names from store to store, to prevent you from comparison shopping. We think this is wrong, and have done the work to help you understand what models on our site match up to those you may have tried in a store. That way, you can always get the best price. TIMING: You'll receive your mattress in about 2 to 3 weeks, anywhere in the continental 48 states that's road accessible. Check your zip code for an estimated delivery date. Just right amount of plush and firm! Very happy with this mattress. Just the right amount of squishiness on top with excellent support. (I tend to want a firmer mattress than most folks -- helps my recovery from a grueling workout preventing lower back pain). I tend to sleep mostly on my back, but sometimes on my side, and this mattress does both well. 6'3" 175# -- not a "big guy" and this one is "just right" for me. Edge support is excellent as well. I'd buy this again in a heartbeat. Very comfortable, very happy with this purchase. I bought it before Thanksgiving, and had to wait a month for it to arrive. Despite the wait, I was able to get a price match when it dropped for black Friday. My mother loves the mattress great buy you are now the people that I shell be doing business with I have already told all of my friends and family about Us Mattress. Com. Bought this for my college bound student - loves it, super comfy and priced right!! this mattress is not very firm to the touch, but when lying on it, it is fairly comfortable. when we laid on it it was extra firm which i love and i think i fell fast asleep on it within minutes. This mattress was very good quality and at an excellent price. I highly recommend it to anyone looking for a new mattress. We got a queen. I made a very good decision!! I bought the Adda III mattress for my “guest room” at my daughter’s new home in FL.. My SIL built me a Murphy bed for my winter stay. I just came back from a 2.5 week visit in August and loved the new mattress. I slept so much better than I do at home! Guess it’s time to replace my old one there! The only thing I need is a bit more cushioning on top but that’s an easy fix with a luxe mattress pad. This is a great mattress for the price. It is comfortable and provides the support needed. Highly recommend to others. I like the mattress and boxsprings. It's firmer than what I was expecting from a plush mattress. I am a side sleeper and think this would be a good mattress for a back sleeper. I was not impressed by the delivery. One man in a full-size semi truck pulled up in front of the house to deliver. The mattress set was to go to the second floor of the house. Also had a king size to be picked up and disposed of. The man did a good job but I still had to help somewhat. I could not believe they sent one man to do this all by himself. I liked that the mattress and boxsprings were sealed in plastic and inside cardboard boxes. I felt more secure knowing that no possibility of bedbugs or soiling was on my new set. I would recommend this bed for someone who likes a firm mattress. The price was good. The people at US-Mattress were good to deal with. Very polite and helpful. So it's been 2 months and I have to say it's a nice mattress,a little softer than I thought but the backaches are very minimal compared to the previous mattress.it kinda stinks you in a little but I like that,and I'm a big guy a little over 300.i sleep in all positions and it feels good.i recommend this mattress to anyone. Did a lot of research and I am very happy with my Adda 111 , as well is my daughter with hers. We received excellent service and prompt delivery. It was a pleasure doing business with us-mattress. Love this bed. Recommend for people who like soft fluffy beds. I sleep all positions and this bed works. The mattress is nice and firm which does wonders for my back. Just right... not too firm or too soft. My son also enjoys sleeping on my new mattress. I love it!! I have two of these mattress’s in my home and bought a third one for my mother’s home. Great Mattress! Soft Comfortable and High Quality! This was my latest mattress replacing one I had for about 7 1/2 years. I had always bought very firm mattresses in the past but after looking at the reviews and suggestions on US-Mattress and researching this brand I have to say its the best sleep I have had in a very long time. I have less fatigue during the day and fall asleep much faster and stay asleep without tossing and turning. Comfortable. A bit softer than expected even for a plush. No back pain. Stable. Individual coils allow movement without the jiggles. Happy with all aspects of my order. Great product. Excellent service and delivery. Great mattress. I've had it for about a month now, and it is softer but also firm. I think it is rated a 7 or 8 with softness, so I was expecting it to be a little softer than it is, but for someone in their 40s, there is also a firmness for decent support. I would definitely buy it again for the awesome price. Very nice mid range priced mattress. Mattress is as plush as promoted in listing.